We believe in educating our patients about their eye conditions and treatment options — and there is a lot you can learn on your own, provided you know where to find trustworthy information that has been reviewed by ophthalmologists and other eye care professionals. In addition to our own website, there are other sites on the Web that provide interesting and useful eye care and vision health information. The following sites and organizations provide such information. All About Vision: This site provides quality information about many areas of eye care, including LASIK and laser vision surgery, as well as eyeglasses, contact lenses, low vision, eye exams, computer vision syndrome, glaucoma, cataracts, macular degeneration, and other eye problems and diseases. Contains eye doctor Q&A’s, frequently asked questions, and much more. EyeHealthWeb: An informative website offering a plethora of information to consumers interested in learning more about overall eye care health. Topics include everything from eye care, eye health, refractive surgery, eye conditions and diseases, choosing proper contacts, maintaining eye glasses, and much more. EyeSmart:EyeSmart® is a public education program developed by the American Academy of Ophthalmology. EyeSmart’s comprehensive website offers credible information about common conditions and overall eye health. Below are some of the most recognized professional associations in the fields of ophthalmology and optometry. American Academy of Ophthalmology — The Eye M.D. Association: The American Academy of Ophthalmology is the largest national membership association of Eye MDs with over 7,000 members internationally. The website provides an in-depth look at eye care health, while providing their membership with ongoing learning and support. American Board of Ophthalmology: The ABO is an independent, non profit organization founded in 1916. This organization is responsible for the certification and continual learning for ophthalmic practices across the country. HealthCentral: Healthcentral.com is one of the most trusted sources of medical information and up to date news and provides a doctor-approved health encyclopedia of diseases and conditions and the ability to find symptoms and treatments. The site also has information about drugs and their side effects and interactions. HealthFinder: Features daily health news on a variety of useful topics. Includes some health information sorted by gender, age, and race. WebMD: The world’s leading source for trustworthy and timely health and medical news and information. Provides credible health information, supportive community, and educational services by blending award-winning expertise in content, community services, expert commentary, and medical review. You may bring your used, unwanted glasses to our office for donation. We work in conjunction with the Lions Club to recycle eyeglasses for those in need. The Lions Club accepts prescription and reading glasses, sunglasses and plastic and metal frames. 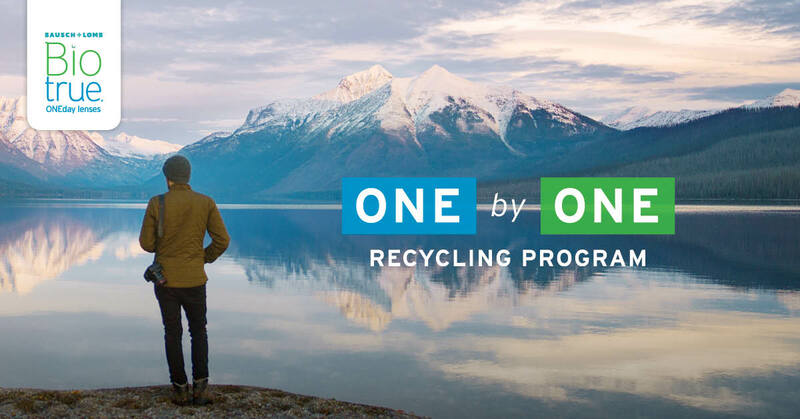 We are an of ficial recycling center for the Bausch + Lomb ONE by ONE Recycling Program. Just bring any brand used blister packs, top foil and contact lenses into our office and we will ensure they get to the proper place for recycling. Learn how you can recycle your contact lenses and packaging at BauschRecycles.com.